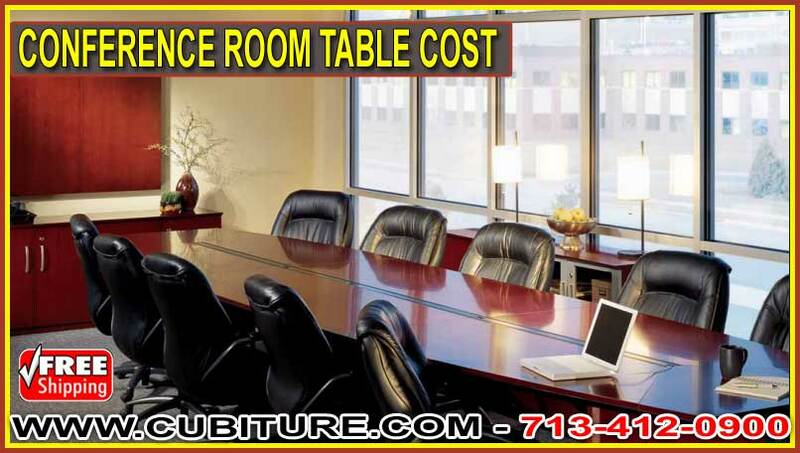 What Factors Determine Conference Room Table Cost? A conference room table can be a strong workplace centerpiece, not just visually in the physical office, but conceptually for the business itself. Through meetings, they set the stage for ideas to come to fruition and for long- and short-term goals to be established and refocused. These days, the conference room table can also be a de facto lunchbreak site, facilitating casual interaction among employees or just offering a change of scenery. Whether it’s a first-time purchase or a replacement, if your company finds that it’s a vital office component, then putting in the time necessary to choose the right conference room table isn’t just time wasted. And as long as you consider cost, it isn’t just money wasted either. Depending on your budget, certain factors can matter when choosing a conference room table, such including material and size. No matter what features you’re looking for, at Cubiture we can help you in determining and delivering the table that’s perfectly suited to your conference room while also working within your budget. The most notable feature of your conference room table is likely to be the material, such as wood, glass, plastic, and laminate. With this wide range of choices, you’re guaranteed to find a material that matches your workplace’s overall stylistic and conceptual flow. Wood has been a very popular material, though price points can vary depending on type. Cherry and mahogany are two sturdy, hard and beautifully rich woods that are very commonly used, communicating a sense of status and formality. However, due to its high cost, it’s not uncommon to outfit your conference room table with an alternative veneer style, in which a thin sheet of wood of your choice overlays particleboard for a cheaper alternative that mimics the style of solid-wood furniture. The major drawback is its susceptibility to damage compared to solid wood, so care might have to be taken to maintain it. The size and shape you choose can factor into the cost of a conference room table, with more material meaning greater cost. Everything else being equal, a smaller table will mean a lower cost. Round and square tables can have a similar pricing structure, but they tend not to be the best shapes available. Round tables can represent a sense of equality among staff, but they’re not space-efficient in our typically right-angled conference rooms. Square conference room tables may be a better choice, but even one large enough to accommodate all staff will still feature considerable dead central space that’s really only useful for stored personal belongings or catered meals. Rectangular tables are by far the most common and spatially efficient shape of conference room tables, though they’re also costlier in general. Aside from the basic rectangle, there are several variations in shape, including the “racetrack” type and the V-shaped “keystone” type, which is best suited to video conferencing. There are also tables we refer to as “U-shaped,” allowing the leader of your team to occupy a heightened, central position. Another worthy aspect of the conference room table is its role in supporting audio and video media, with the inclusion of built-in wires. Our society’s deepening reliance on digital information and technology has made it so that the average business meeting can feature anything from manually taking minutes to set up a skype correspondence. You can customize your table to include HDMI, USB, and other data ports in order to keep up with the changing nature of the business meeting. Whatever type of table is ultimately useful and cost-effective for your office, Cubiture can help you to determine the correct conference room table. Feel free to send us pictures of the types of tables that resonate with you, so that we can stay ahead of what it is that you need for your conference room.